So I had just handed in my resignation and it was becoming very real that this is, in fact, happening and there is no turning back now. The first thing is that despite the huge consideration taken to come to the conclusion of resigning, the actual act of resigning is phenomenally anticlimactic. As much as we would all love it be a scenario where we burst into the office, slam a resignation letter down on the desk and walk off into the sunset of freedom and opportunity, it does not really work that way. You have a polite conversation where you agree your notice period and then the following day, your first day of “freedom”, you go……to…..work. As i said, fantastically anticlimactic. So over the 6 weeks I had agreed as my notice period, I found my plans slowly change and become more and more what I actually wanted. As mentioned in the previous post, dropping safety nets was the first challenge, but what surprised me was that it was a more step by step process than I expected. Once I had convinced myself to leave, my plan was a relatively conservative 1 month off and then look for a new job. This gradually changed to trying to find a way to earn money as a I travel, so I lined up a couple of money-making ventures. I will expand on them in a future post. When the time came for me to leave Singapore, I was leaving myself only 3 days between finishing work and leaving the country. The plan was finish work on the Friday and be out of the country by the Monday. However, this turned out to be unrealistic due to various scenarios, both self-inflicted and external factors. I was incredibly enthusiastic to get out on my adventures, while still working the logistics of leaving. The time had come to leave and I was trying to finish up in my apartment, ship my belongings to the Philippines for storage and get my arse out of the country. This is around the time I found myself in a weird half way place between releasing the material items I did not need and ruthlessly haggling for the best price so I could live free that little bit longer. I also felt it was too cliché to fly out of Singapore. I flew into Singapore day 1 in business class to be collected by a limo taxi to take me to my apartment, leaving on a budget airlines flight did not seem to fit, not because I believe I should be leaving business class but because this wasn’t my preferred mode of transport. So I did the logical thing, I took a bus. As I was packing up to leave, I woefully miscalculated what needed to be shipped and what needed to be carried, so I found myself running to the bus in Golden Mile Complex in Singapore for a bus to Kuala Lumpur with about 30-35kg of bags. This was my first error of the trip. The important thing to remember is that errors and mistakes will happen and it is simply about learning from them. The corporate environment does not allow you to move beyond errors but in the real world they are a learning opportunity. I think this is one of the first things to get into your mind whether you stay or you leave whatever work you are doing. So for you reading this, make mistakes. Make the most wonderfully ridiculous mistakes and learn the lessons that are then (hopefully) clear. This is the best favour you can do for yourself in the short-term. Now, I will tell you that it is worth your while, if cost is your concern and time is on your side, to pop to Johor Bahru and take a bus or train from there. The price basically changes from Singapore dollars to Malaysian ringgit, but the number stays the same. Meaning, it could be 30 SGD in Singapore and 30 Ringgit in Malaysia. May seem like madness, and it is, but it is 100% true. A very handy reference point for this is (http://www.seat61.com/Malaysia.htm#Tickets%20bought%20in%20Singapore) . So on this particular bus journey there happened to be a car crash outside Kuala Lumpur which backed up traffic for about an hour. The site of my seat mate, some random dude, jumping up and down and looking at his watch suggested he seemed to be in far more of a hurry than I was. It was a nice reminder that my schedules are now my own and flexible using the wonderful(and long forgotten) art of common sense. A further quirk, which I entertained myself and most of the passengers, was that the bus broke down in the middle of the road in KL, blocking up half a street. This seemed to entertain my seat mate less, who now seemed like he would, in fact, explode. Finally arriving in Time square in KL, I was not feeling fantastically well. The last few days had been a lot of rushing and not a lot of rest, so I was starting to feel the flu come on. Further to that, the previously mentioned overly heavy bags clearly required me to drop so weight. So for once I took the easy option and instead of continuing on, I stopped for a night. A quick walk to the local Starbucks, sit outside so I can steal their wifi(and not buy their terrible over priced beverages) and I booked literally the closest cheap hotel to where I was sitting. I wont write too much about Kuala Lumpur itself, because I really have not seen much of it and I have promised my friend , who is a local there, that I would be shown around by her, on this occasion she was away on holidays. Therefore I will leave my Kuala Lumpur review for a later time but I will take you through my first night there. 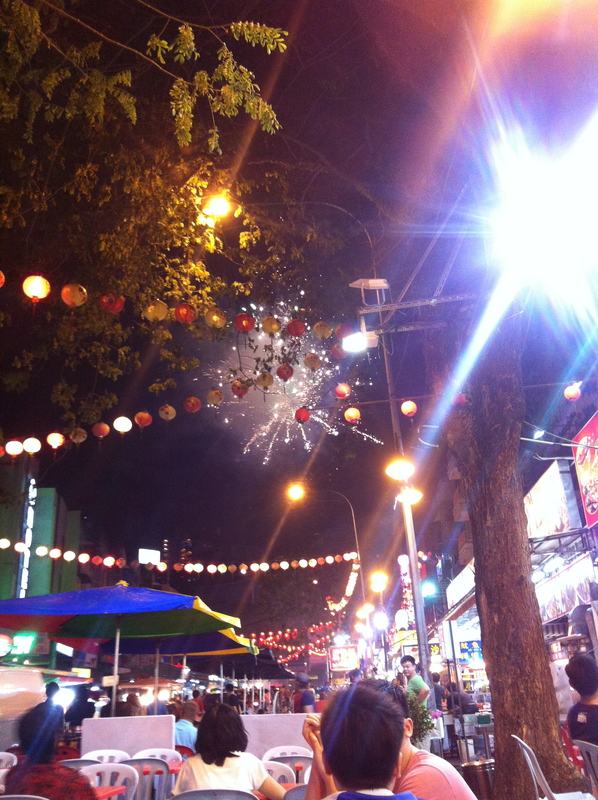 There I was, sitting alone in Bukit Bintang, as Hari Raya was celebrated with fireworks above the city. I had a lot of things running through my head. Was this the right choice? am I really going to be happy traveling all the time? Will I constantly be counting cost, worrying about running out of money? But as I looked up, eating satay and drinking tea, while watching the fireworks explode overhead, I came to the conclusion that maybe I don’t have the answers to any of those questions, but at the moment, on my first night of actual freedom, it did not matter. The only thing that mattered was that i was trying and it felt fantastic.